This is the twenty-second day of my 31 Days of Living Well & Spending Zero challenge. To read all the posts in order, start with Day One or visit the Overview Page. 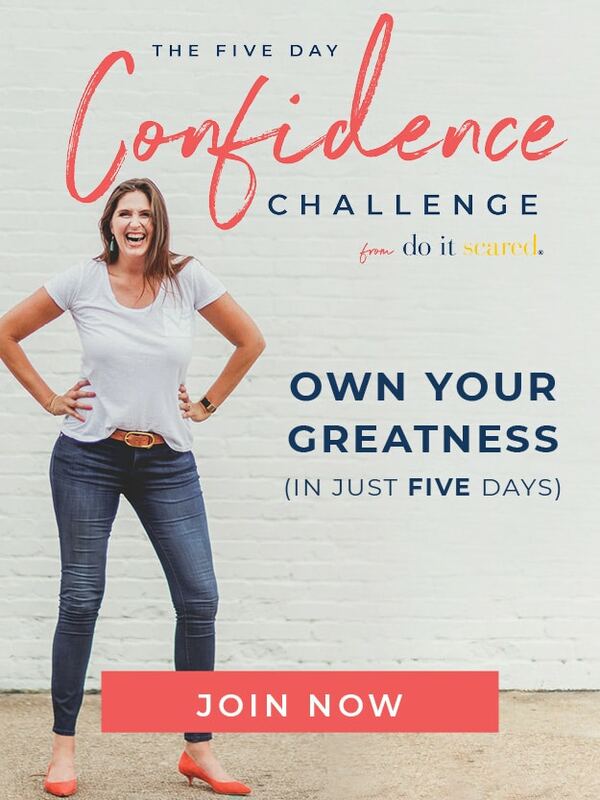 We’ve made it to the home stretch–the last full week of this 31 day challenge! Our first week we focused on taking care of our basic needs, since hunger & boredom are the two main causes of mindless spending. Our second week we focused on cleaning and organizing our homes, learning to enjoy the space that we are in rather than to try to escape it. Last week we started to look at the things we have in a new light, embracing our creativity and making new things out of old. This week our goal is to capitalize on our resources, both financial and emotional. Today we are going to focus on selling stuff we no longer need. There are plenty of different options available for selling things, from eBay to Craigslist to Facebook to the good old fashioned garage sale. Over the years, I have tried all four of these different options, with varying degrees of success. In fact, just this month alone I made over $500 selling by selling stuff I no longer need! Today I am going to give you the rundown on what works and what doesn’t, and when to use each of these options. When to use eBay: eBay is your best bet for selling popular brand name items (Coach, UGG, etc.) that are in very good or excellent condition, or high value items that are specialized & hard to find. It is free to list items on eBay but you will have to pay a commission if your item sells. Because you will most likely need to ship your item, I also recommend only selling items that can fit into a USPS flat rate box. It is difficult to sell anything on eBay if you haven’t established a reputation, so if you have never bought anything on eBay before, this probably isn’t the best option. Take good pictures-for the best shots, use indirect daylight (not bright sun) and NO FLASH! Make sure the background is pleasant and non-distracting, and take pictures from every angle. Choose the right category for your item-try to be as specific as possible so that potential buyers will be able to find your listing. Write a good description-be sure to mention the brand name in the title, along with the condition. Be as specific about the details as possible. If you are stuck for what to write, look up similar items that are currently selling well for inspiration. Make sure your item fits in the box before listing. I always keep a few medium & large size USPS flat rate boxes on hand (they are free at the post office). Charge the USPS flat rate fee for shipping. This way there are no questions about shipping and no surprises at the end. Answer buyer questions quickly-once your auction is live, be sure to pay attention to any questions that come in (always check your junk folder too!) and answer them clearly and honestly right away. If it is a question about item specifics then it is a good idea to post your answer publicly so that other potential buyers can see the answer as well. Wait for payment before shipping-most buyers will pay quickly but never ship an item until you have received your payment! You can easily send an invoice to remind buyers to pay. Ship your item as soon as possible–as soon as you’ve been paid, make an effort to ship out your item. eBay makes this process very simple–you can actually pay for shipping and print your label at home. If you already have the box then all you have to do is tape it up, slap on the pre-paid label, & let your mail carrier pick it up or drop it off at the nearest post office! Give feedback–be sure to write a positive note on your buyer’s feedback page. They will hopefully then return the favor so that you can have even more successful sales in the future! 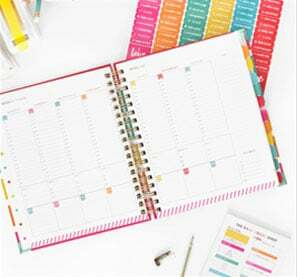 When to use Craigslist: Craigslist is a great option for selling furniture, toys, & household items that you wouldn’t want to bother with shipping. It is definitely more popular in some areas then others–I had way more success selling on Craigslist in the Seattle area than I do in Southwest Florida–but since it is free to list your items, there is really no reason not to try! Don’t set your price too high. We’d all like to think our stuff is worth close to what we paid, but the sad truth is that used stuff isn’t worth all that much. Do a search for your item to find out what other people are asking. If your price is significantly higher, don’t expect any calls. Don’t be afraid to say no to an offer. If someone offers you less than you think your item is worth, don’t be afraid to hold out for more money. Craigslist is free and you can list your item as many times as you want (within the CL guidelines.) Determine whether it is more important to get rid of an item quickly or to get your full asking price. Don’t over list your item! Follow the Craigslist rules or you will be flagged and ALL your listings will be removed. Each region is slightly different, but as a general rule you can post any given item once every 7 days. Consider bundling like items. Selling a lot of toys or clothing is easier and faster than trying to sell them all individually. Stay safe. Meet in a neutral public location or make sure you will not be home alone if someone is coming to see an item. When to use Facebook: Facebook is free and super easy so there is really no reason not to try Facebook first. Join a local selling group–they have them in almost every city these days–then snap a picture and list a price (follow the same tips as Craigslist above.) If you can’t find a group join, you may want to ask around to see if any of your local friends have heard of one, or you can simply post your item on your own Facebook wall. If it doesn’t sell you can always try Craigslist or eBay. 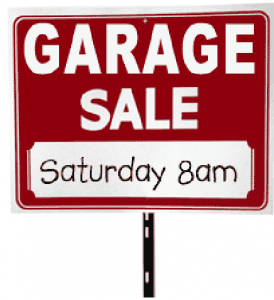 When to throw a garage sale: If you have a LOT of stuff to sell and you live in a great neighborhood for garage sales (close to a main street, lots of drive-by traffic, etc. ), then a garage sale might be a good option. For most people, however, I think spending your time and effort getting the best prices for your higher-value items on Craigslist or Ebay, then simply donating the rest is probably a better use of your energy. Join forces-convince some friends or neighbors to join you and hold a multi-family sale. You’ll get a lot more interest and have an easier time promoting your sale. Promote your sale-advertise on Craigslist, take out a classified ad, & post a notice on Facebook. Put up LOTS of signs all over your neighborhood with CLEAR directions on how to find your house. Be prepared-borrow tables to hold your stuff & price everything the day before. Label your items well. Have plenty of change available. Be sure to have an outlet available for testing electronic items. Be willing to bargain-garage sale shoppers will want to make offers. It is okay to start out firm and get more flexible as the day goes on. Have a plan for the leftover items-don’t just let them sit in your garage! Either list remaining items on Craigslist/Facebook/eBay or deliver them to Goodwill. 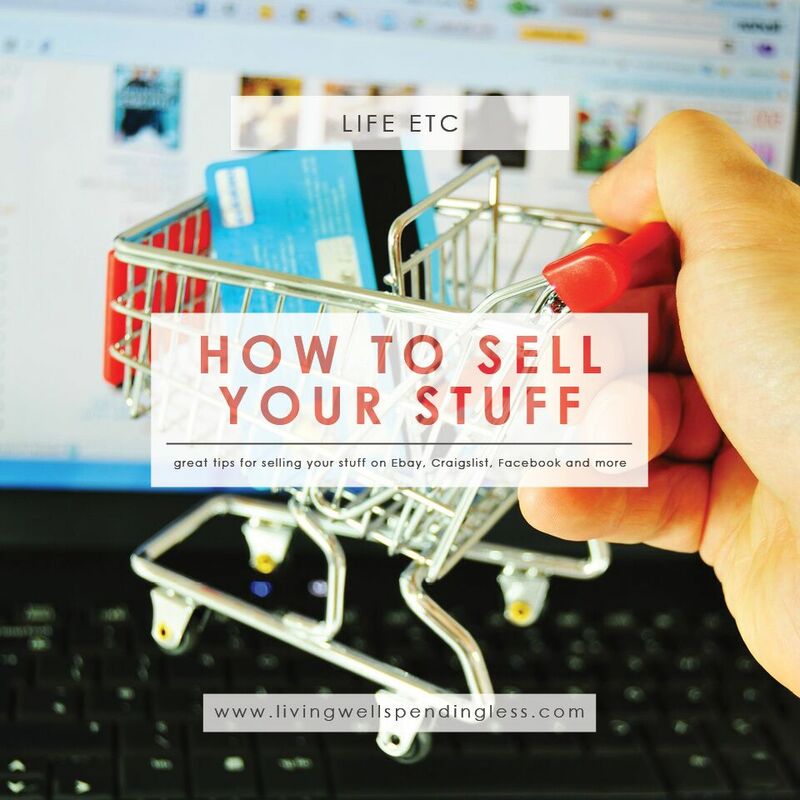 Today your assignment is to start selling the stuff you no longer need. Take a long, hard, honest look at the things you have and pick a few things you are ready to part with. 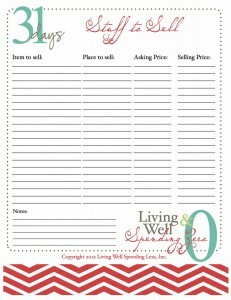 You can use this worksheet to keep track of your items as you sell them. How do you get rid of the things you no longer need? Do you sell it? Give it away? Do you have any tips to share? http://www.thredup.com is another option for all the adorable kids’ clothes that do not fit your adorable kids anymore. Very easy to sell to. I LOVE ebay selling! It has become a hobby for me and I sell everything and anything on there. lol .. I go through phases though as I do get bored with it. But I’m going to be working on it again, as I have lots of kids toys to sell and with Christmas coming this time of year I usually have great luck selling toys and winter clothes! I’ve never tried Craig’s list..
I’ve never tried selling toys on eBay–do you find you have good luck with that Debbie? I usually save eBay for my higher value items, since people will have to pay for shipping. I have had wonderful luck with toys especially getting close to Christmas and I always make sure they are cleaned with clorox wipes, etc. I have sold toys for more then I paid for them originally! It really depends on the item though. But I also sell alot of kids clothes, snowsuits etc. I’ve sold everything from dishes to wall border, to a wall clock that I got $107 for. It really depends on what you have, and what you want to do. Since it’s a hobby for me I just enjoy it, earning whatever I can. If I don’t sell the item it goes into the donation box. 🙂 My next venture is going to be trying to sell my baby furniture, swing, stroller etc. Shall see how that goes! And I love eBay. I haven’t sold anything recently but have been selling there for years so I have built up great feedback and when I do sell, I have pretty good luck! Very helpful article.. I especially like the breakdowns on the do’s and don’ts with Ebay and Craigslist. I had a lot of items to sell, so I started selling them on craigslist, but also started a free website at blogspot.com. For every item I listed on craigslist I referenced the website so they could click on it. Then they could see all of the items I had for sale. I have such a range of items for sale that hopefully while someone is looking for boy’s shoes, they notice a light fixture that they need! Thanks for the reminder! I had some excess stock of Sheer Cover makeup I’d ordered from an infomercial – they automatically renew and I kept forgetting to cancel the auto-ship. I sold everything on eBay last week and even made a little profit. (I did finally cancel the shipments – wouldn’t be frugal not to). I live near D.C., and Craigslist is hugely popular around here. My proudest moment was when I found a clean, gorgeous rug at Goodwill and immediately recognized it as a Pottery Barn piece. I paid $10, researched it online and realized that it retailed for over $200. I photographed it from different angles and pointed out one tiny flaw. I then posted it on CL and included a link to the Pottery Barn website (so people could see the price for the rug when new) and sold it on Craigslist for $75. I felt like one saavy shopper!! Have you ever tried selling on Amazon.com?? I’m trying to sell some of my old college books, any tips or tricks? I always used http://www.bigwords.com/ when buying and selling used textbooks. They compare several book buyback websites and give you the cost breakdown for each. http://www.bookoo.com is where i like to shop/sell! We have had alot of luck selling on Craigslist, very informative article! For books/DVDs/CDs etc I post on half.com. It’s affiliated with eBay so you can up your feedback score. It’s free to post and they sit on the website until someone buys! Then you pay a small commission, but they reimburse you for shipping so it’s really hands off. I basically have all the books and DVDs that are sitting on my bookshelves up on half.com! details to pay and get money. Thank you for your input….would love to see a selling place in S Florida…..
It’s actually illegal to sell coupons in the U.S. , unfortunately. However, I’ll bet that if you give Ruth your info, she might include it in her blog so people can send you their extra coupons. Thanks for the info! I have so much stuff I don’t need. Lots of old/vintage dishes, ceramic pieces, colored glass, I don’t even know what to call it, it was all my Mother’s mostly. I’ve learned the hard way that garage and yard sales are exhausting and don’t bring in much money. To me they’re not worth the effort and time involved, as the people who come expect you to practically give your stuff away. (Maybe because of the area where I live.) Since I’m not knowledgeable about these vintage items it is difficult to list them for sale anywhere. I feel overwhelmed but need to sell things, but not sure what to do. This info is very helpful, and I appreciate it, thanks. Nancy, one tip I’ve seen is to search on ebay for the item you want to sell, look at the Sold listings for it or similar items, then calculate an average price based on the last 5 that sold. That gives you at least a ballpark sense of what the price should be. And other sellers listings are often very educational, regarding item makers, history, etc. Take it just one step at a time – what’s the ugliest, least-favorite among the items you want to sell ( or the bulkiest, hardest to clean, most in the way). Then research just that one item to start with. In my area we have a large, twice-a-year consignment sale called Reruns Are Fun and Homeruns where I sell most of my stuff. There is also one for children’s items called Rhea Lana’s. Your area may have one that you just haven’t heard about. I have bought some things on eBay and finally listed a few things to sell. Setting a price and determining shipping were the hardest for me. I found that eBay searches for the same or similar item are very helpful. I also like the idea of using the flat rate boxes. I really appreciate the Craig’s List tips since I have some furniture I’d like to sell. I would like to sell but don’t know how. Every one said it’s easy. I’ll go help you and they never show up. So I’m still working on it. I hosted a “freebie” party once for our school group just before Christmas. Each family brought items (as many as they wanted) to the party, the children then got to choose Christmas gifts for their loved ones from the stash! It was so much fun & easy to host. I just provided wrapping materials (we helped the younger children wrap so parents & siblings could be surprised!). A friend is hosting a similar event next month – her “freecycle” party! Same idea – another(wo)man’s treasure… I am so excited to run through my house to find treasures to swap! I still display a beautiful wire bird that another family brought to my party from 3 years ago. One of my children chose it for Dad but it was *my* favorite gift of the year! In the years I was a single mom of small children, the only thing under my Christmas tree that I didn’t know what was in it had been made by my children at school and daycare. Those gifts still hang on my tree now some 30 years later and my eyes still mist over when I see them. Thank you so much for what you do … those two presents from daycare were the only Christmas gifts I got one year. You make a difference. There is a special place in heaven for your kind of Angel. If you’re looking to buy and sell kids used clothes online, you can check http://preluved.com/. 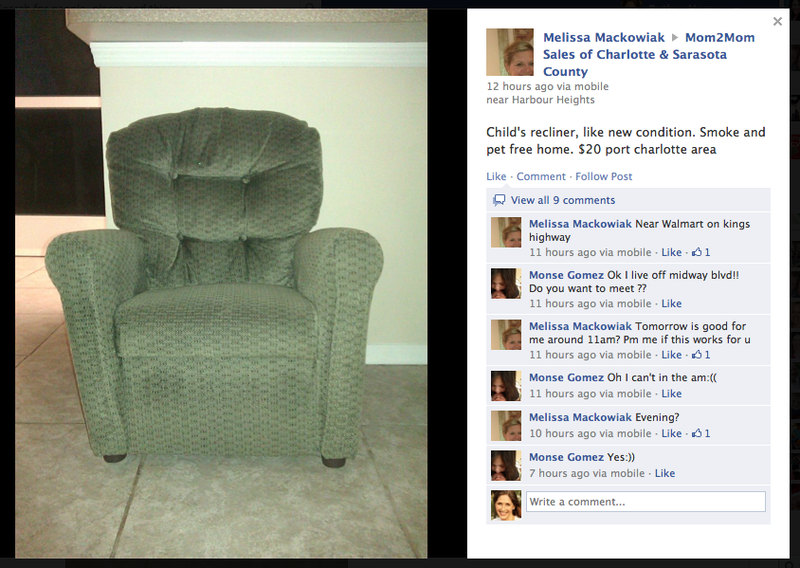 I think it’s the convenient way to buy and sell your kids stuff without leaving home. You can also find great items and brand name clothes to suit your taste for clothing. We take our things to a local consignment store which is so nice for me. It’s WAY less hassle than trying to sell it myself. I know that I won’t make as much, but it is QUICKLY out of my house, I get 50% if it sells, and I never see it again if it doesn’t. Plus, I’m helping other people run a business which is nice. Helpful info, but I have to disagree about shipping eBay items via flat rate only. As both an eBay seller and buyer, I know that that is much too expensive for a lot of items, and people are not willing to pay out-of-proportion shipping expenses. While it takes more work, I always ship for actual shipping costs unless the flat rate seems appropriate. Agreed. Flat rate works when the item purchased is high ticket-then the seller is more likely to pay. Plus with ebay mobile, listing with calculated shipping is easier than it used to be. And don’t forget media rates for books/dvds. **always ship as fast as you can-right after payment. You can schedule the item to be picked up from your door by your postal carrier, so no trips to the post office. What are media rates? Does it cost more to send books/dvds? I get books from authors for my reviews, but I have never shipped any type of media mail. I didn’t realize this was even a thing! How do you get to be a book reviewer? I would love to do that. Morgan, I saw that you work for eBay, I have a very important question. I use to sell on eBay but was terminated from selling. Can I ever go back? Hi Jan it depends on the reason for termination. If it was a selling restriction than unfortunately not but if it was because of nonpayment or something like that than yes you could. I have been very disappointed with Craig’s list. So many people have said they will show up and never do! Or else they ask a question, I give them an answer and they don’t reply back. Have you ever sold on Instagram? Or anyone else? I just discovered local Facebook groups and craigslist. There are good and bad about both. So far most people have been great but a few have been really annoying. Asking a ton of questions and then they decide you are too far away even though you have said where you are located in the ad. Urg. Lots of people change their mind or say they are interested only to find out yes they want your item but don’t have any money. I have been lucky though only one no show in the last week. Frustrating but not too bad. I find that I am making more money than a garage sale but it is time consuming. To keep checking for messages and bumping your items. I am hoping to sell a few more items this week and if not then I will donate them and just take the deduction. I think I will also look for a few more items to list as well. I think these methods take patience. money which otherwise would have gone in buying a new car. proof the selling is in looking. My Mom is not computer savy ad doesn’t want to be so she sells her stuff by running ads in the newspaper, posting on bulletin boards around town(ie-laundry mat, vets office, store fronts, at work etc.) and in the free magazines like Bargain Post. She has always had great success in selling her listings. She has the best luck advertising in the newspaper and posting at work. Hope this helps. I use the site garagesalecow.com for searching sales near me. Valuable information. Lucky me I found your web site by chance, and I’m surprised why this coincidence didn’t happened earlier! This is great! I’ve found Ebay to be the best in terms of “set it and forget it”. You don’t have to meet up with anybody and the entire transaction is done online. I suppose the only challenge is that Ebay and Paypal take their share of the pie. You have given some great tips on effective selling though! First of all, congratulations for this blog, it’s very nice to follow you. I would like to sell handmade goods, such as coin purses. Debbie, what do you think would be the best way to sell these types of items? And what are some tips on how to make it seem presentable to others? The best place to sell handmade items is etsy.com . I find people coming to garage sales are looking for really really cheap prices. It might also depend on the neighborhood but I can sell my stuff on Craigslist for a better price. I also got good deals on Craigslist for some household items without having to travel around the town for garage sales. I used to sell on eBay before I got on Craigslist. There is the “going to the post office” side of it. For me it’s much more practical to have people come and pick up stuff. I find this blog very informative. I sell on Ebay all my family and children preloved clothes in lots and items,books,toy and so are New. I also sell my Diaper Cakes!, I must say that it a great and easy way to make extra cash and also clean out your closet,garage,basement and the best if all in the convience or your own home. 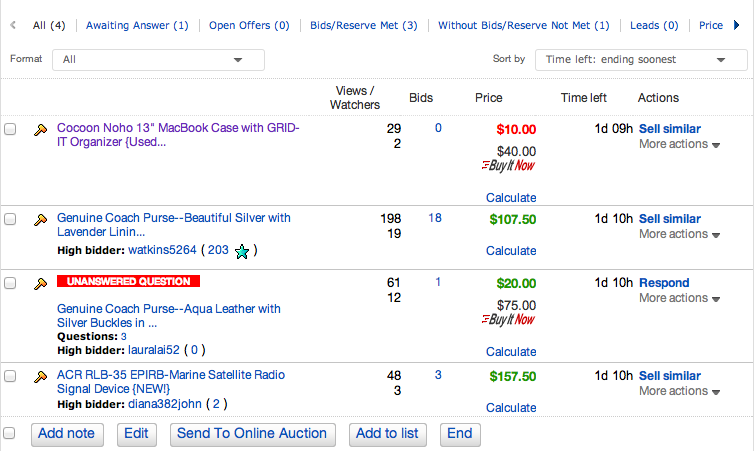 You should write a post on your blog on how to organize your inventory for Ebay selling . I definitely want to try and sell some of my stuff this year. I always get as far as putting it in a pile, that sits for a while, and then eventually just goes to Goodwill! Thank you for the information! I have been wondering how to sell an antique armoire and an antique dresser with mirror. I am hoping to raise money to pay for a Service Dog I am in need of and thought perhaps the sale of these items could help pay towards the cost! My problem has been do you need a tax id and do you need to set up a business account, especially for things you hav hand made? It has taken me days and days to set up a paypal business account and am still trying on Pinterest. This is exactly what I am doing. I’m gearing up for a move to the beach, and realized that it’s time to liquidate. Some other options that weren’t mentioned are varage sale, donations to needy families, schools, daycares, Salvation Army (homeless shelters), retirement homes, churches, and food banks can direct you to local organizations that accept donations. Super article-very descriptive-enjoyed reading! I love selling in Facebook selling groups! I have sold in craft supply destash groups, local yard sale groups, and quilting groups, but my favorite groups are the ones devoted to primitives and vintage items. Ebay intimidates me. Although once I did search for an old Avon perfume that I wanted to sell, found someone looking for it, connected with her and sold it for at least what I paid for it! I have a bunch of Stampin’ up that needs a new home. Do you think I should get a web site and start a blog if I want to sell things online? I have found all that I have just read very enlightening. I also find that few people who profess an interest in helping rarely do!! I am currently trying to sell 50 years of accumulation! Everything from appliances,furniture,collectables, etc. etc. I also do leatherwork. All that being said you can imagine what I am going through trying to find appropriate sites. I have to say, i have found that your article, and especially the feedback, have been extremely informative as well as helpful. 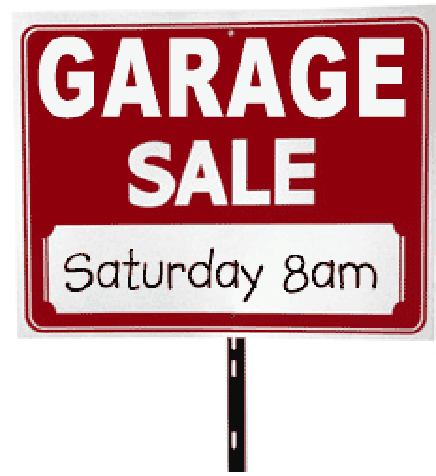 I will be having my last tag/garage sale this weekend. Hopefully, I will be able to move online shortly. Thank you for all!!!! I have tons of stuff to sell and was trying to figure out where to get started. Thanks for the info! What about providing insurance for breakables on ebay? How do you know how much to charge?